The Epson SureColor Road Show has been a great success for both Perfect Colours and Epson. It gave us the opportunity to showcase these fantastic graphics and dye sublimation printers to businesses who otherwise may not have had the opportunity to see one in action. We are delighted to have had such a great reaction to the Road Show and as such we will be back on the road soon. 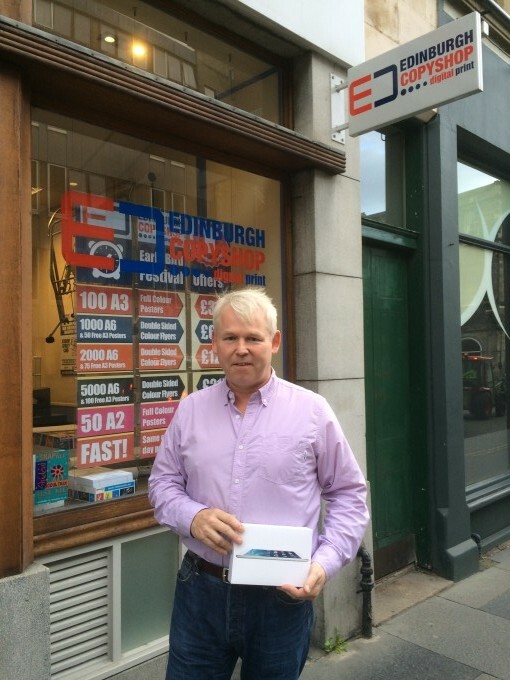 As part of the Road Show promotion, Epson offered those who registered to attend the chance of winning an iPad Mini, Perfect Colours are very pleased to announced that Jon Huffer from the Edinburgh Copy Shop, has won the iPad, congratulations Jon. Jon Huffer, Edinburgh Copy Shop, attended the Edinburgh Roadshow at Murrayfield Stadium and was the lucky winner of the Apple iPad mini prize draw. I attended the SureColor Roadshow in Edinburgh to see the Epson printers being demonstrated as we are considering a new large format printer for our print business, and it was really convenient having the Roadshow visit locally. It was a great surprise to win the iPad mini in the prize draw! Looking forward to 2015, Perfect Colours and Epson have confirmed the possibility of another Road Show, however have not stated when and where this Road Show will take place. In the mean time, business who wish to demo the Epson SureColor SC–30600 or the SureColor F–6000 can request a visit from the truck. For more information and to register for a free demo, use the link below.